Made by Bernadett Szikszai and Lili Bartus. His life István Széchenyi was born in Vienna, on 21 September 1791. 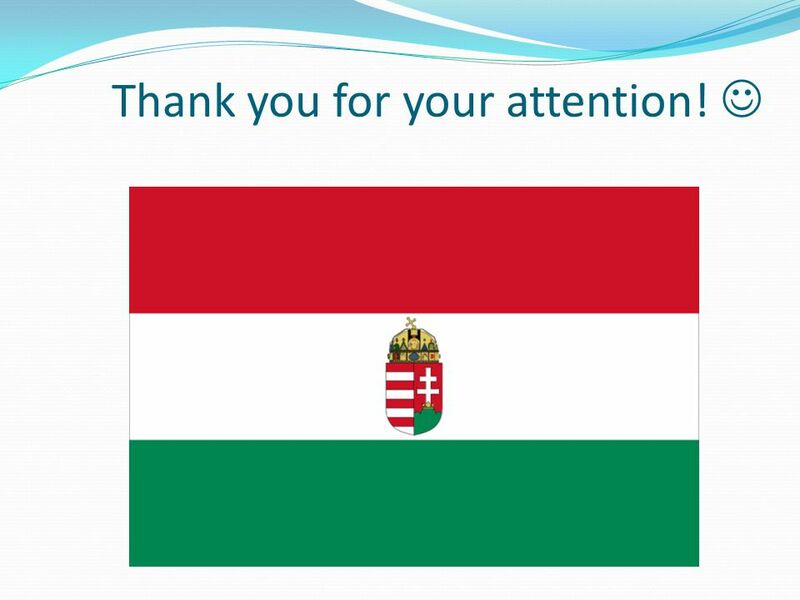 He was a Hungarian politician, theorist. 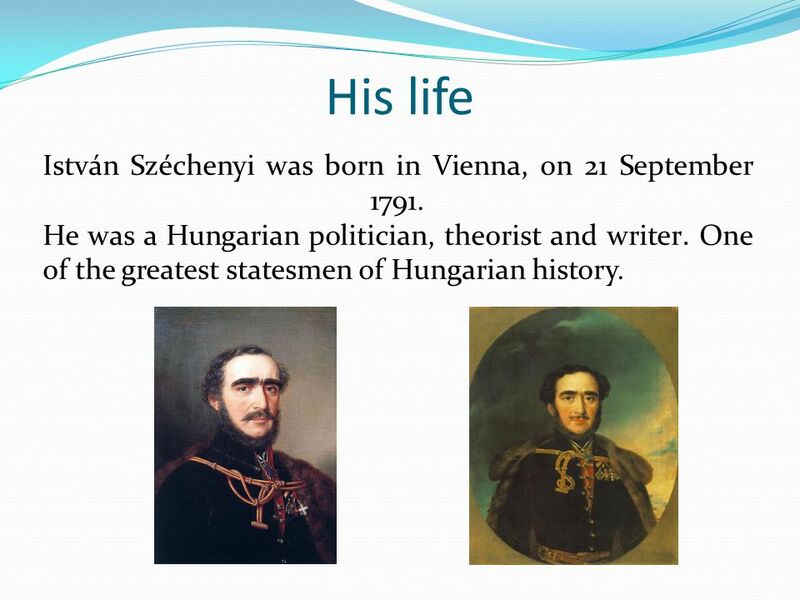 2 His life István Széchenyi was born in Vienna, on 21 September 1791. He was a Hungarian politician, theorist and writer. One of the greatest statesmen of Hungarian history. 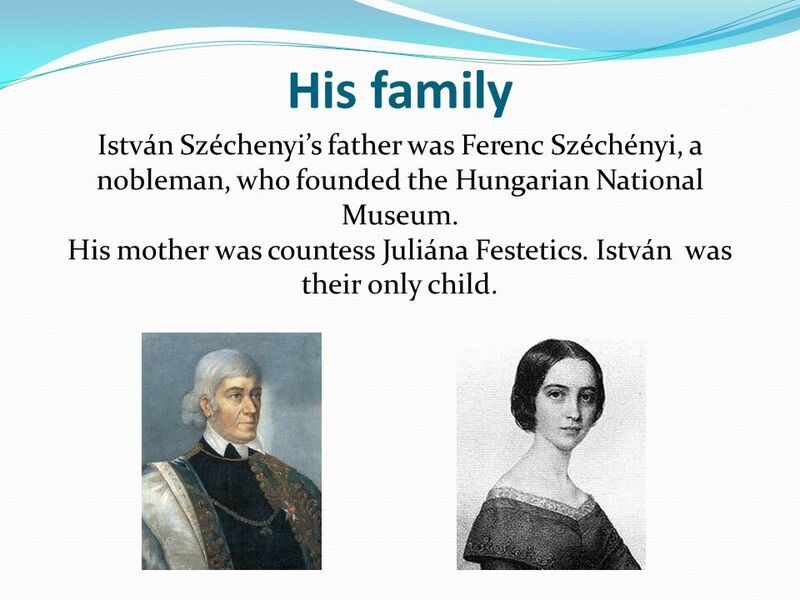 3 His family István Széchenyi’s father was Ferenc Széchényi, a nobleman, who founded the Hungarian National Museum. His mother was countess Juliána Festetics. István was their only child. 4 Why do we love him? 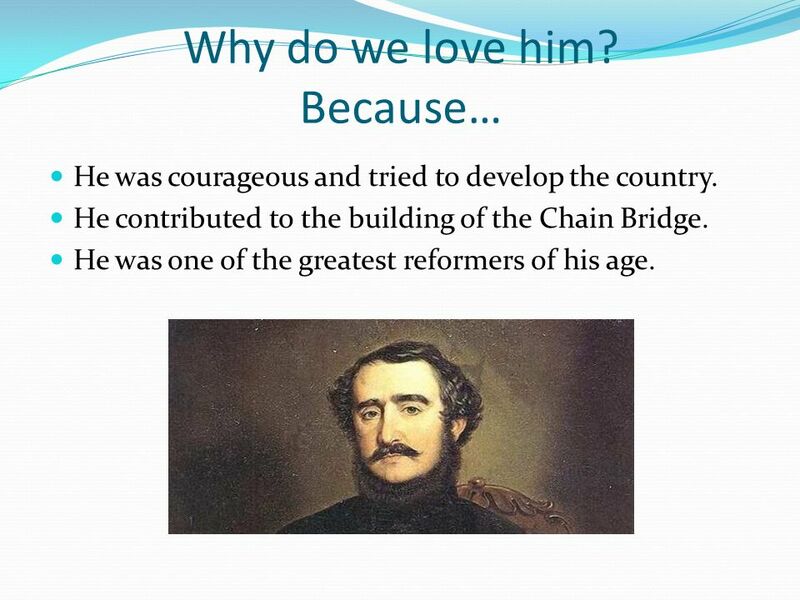 Because… He was courageous and tried to develop the country. 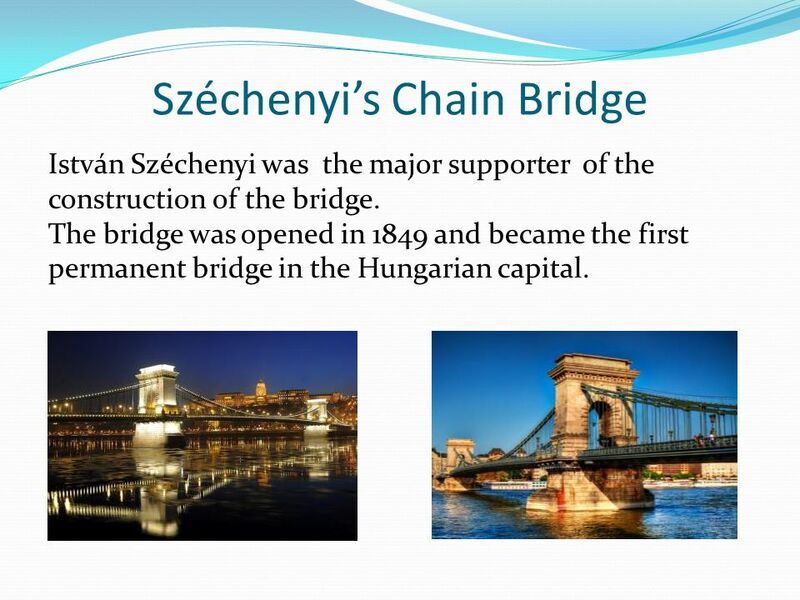 He contributed to the building of the Chain Bridge. He was one of the greatest reformers of his age. 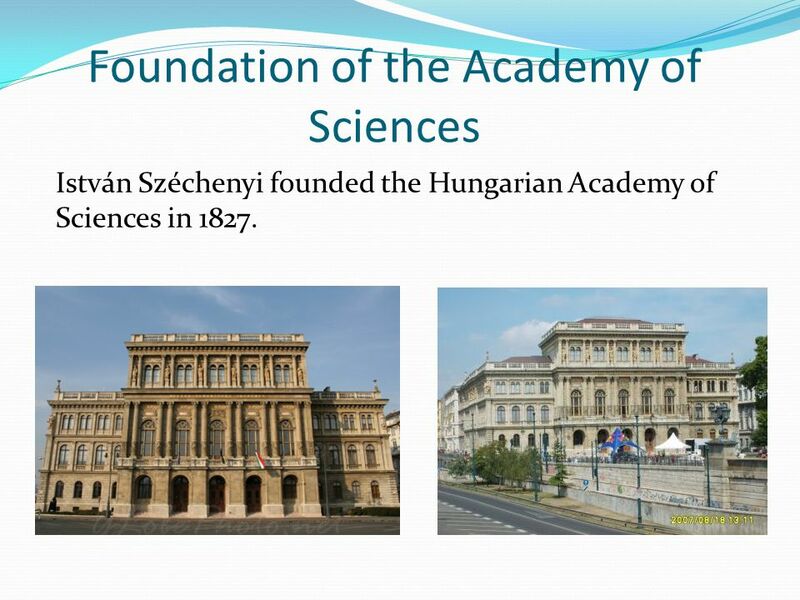 5 Foundation of the Academy of Sciences István Széchenyi founded the Hungarian Academy of Sciences in 1827. 6 Széchenyi’s Chain Bridge István Széchenyi was the major supporter of the construction of the bridge. The bridge was opened in 1849 and became the first permanent bridge in the Hungarian capital. 7 Hitel He wrote the Hitel (Credit) in 1830. 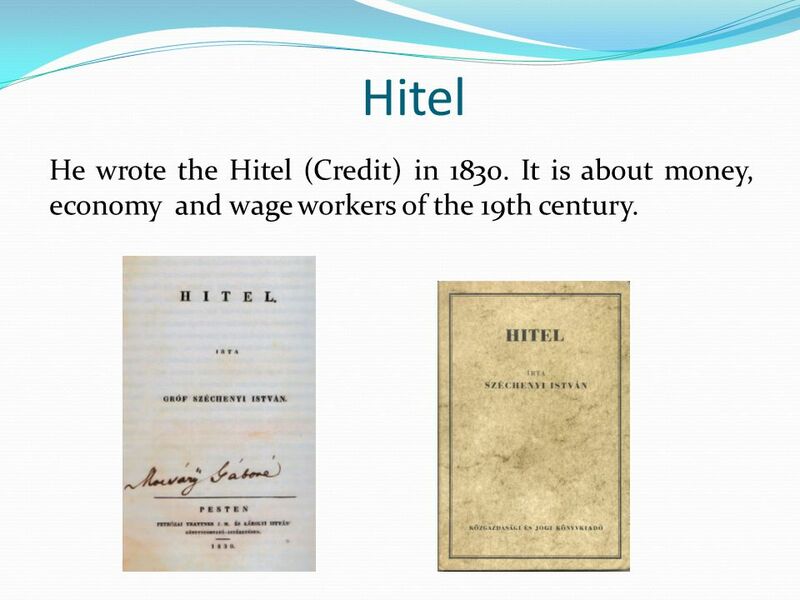 It is about money, economy and wage workers of the 19th century. 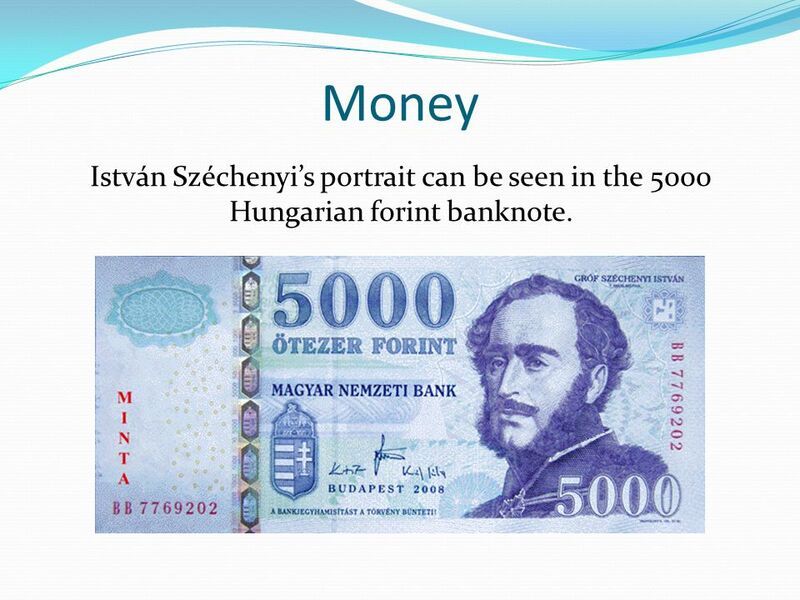 8 Money István Széchenyi’s portrait can be seen in the 5000 Hungarian forint banknote. 9 Death István Széchenyi died on 7 April 1860. 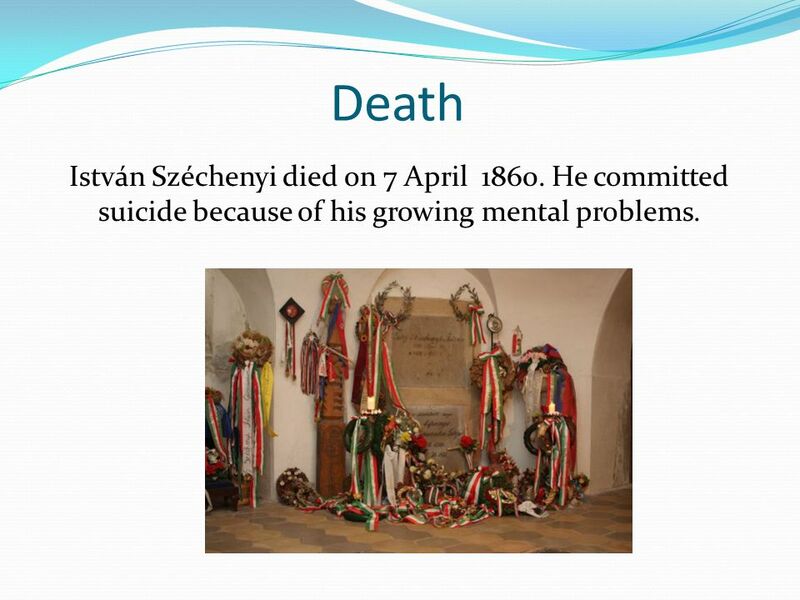 He committed suicide because of his growing mental problems. 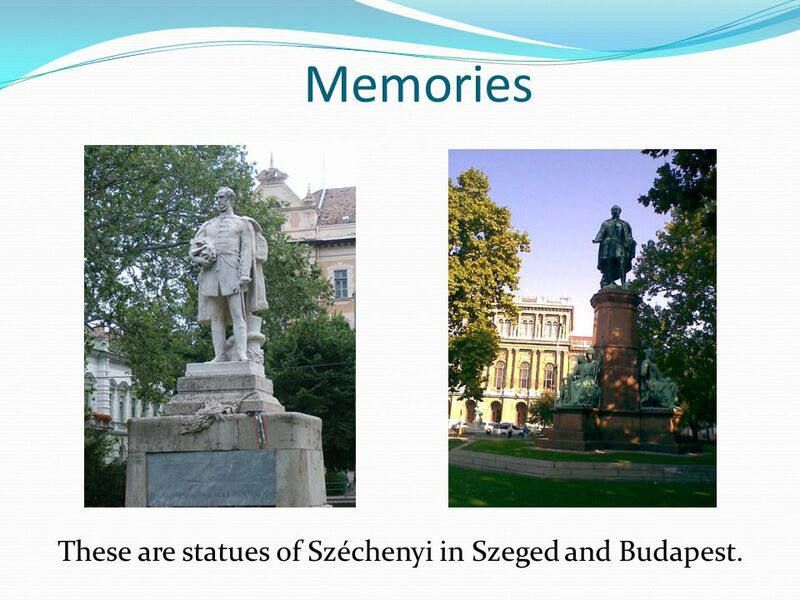 10 Memories These are statues of Széchenyi in Szeged and Budapest. 11 Thank you for your attention! 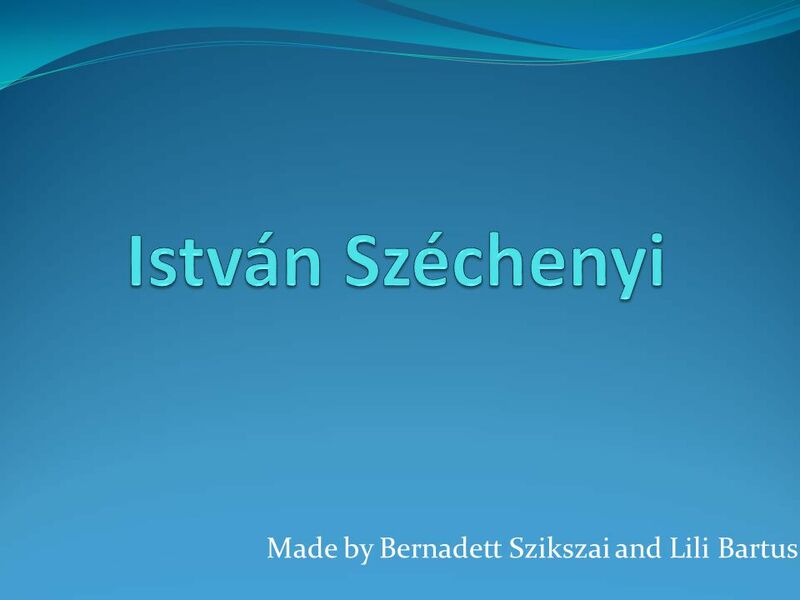 Download ppt "Made by Bernadett Szikszai and Lili Bartus. His life István Széchenyi was born in Vienna, on 21 September 1791. He was a Hungarian politician, theorist." Thomas Stearns Eliot By: JoniMae Straughn. Early Life Eliot was born in St. Louis Missouri September 26, 1888 His father was a businessman and his mother.  Da Vinci was born on the 15 th of April 1452 and died at the age of 67, on the second of May Da Vinci was born near a Tuscan town of Vinci. He. F. Scott Fitzgerald Colton Sledge 2 nd Period US History. Henry II and Thomas Becket Monika Härma. Henry II Was born on 4 March 1133, died in Also known as Henry of Anjou, Henry Fitzempress, Henry Curtmantle. Who was Ray Charles? In 2004 Ray was voted the 10 th Greatest Artist of all time by Rolling Stone Magazine. Ray Fun Facts: 1 Ray Charles was an early. August – May 8 Born August Inherited large family fortune after the death of his mother at age five Went to Mazarin College majored in.  Jonathon Thurston is a indigenous Australian rugby league player who plays for the North Queensland Cowboys and is also co-captain for this team. Jonathan. 23th April 1564 – 23th April William Shakespeare was born in the town of Stratford-upon-Avon, Warwickshire. In a house on Henley street. His mother’s. Ferenc Deák and his life By Lilla Máté & Anna Bek ő.
Thomas Hart Benton. T HE AMERICAN ARTIST Thomas Hart Benton was a major American artist from Missouri. His paintings are famous for showing. Pope Cyril IV “The Father of Reform”.  Born September 26, 1949 in Missouri.  She is an American novelist and essayist.  Well known for her novel A Thousand Acres, which won the Pulitzer. 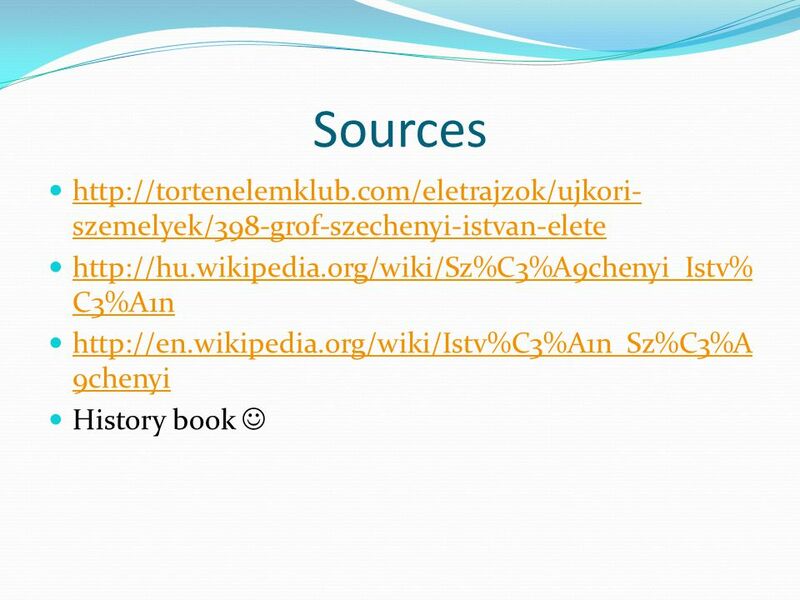 Turkish and Hungarian connection Turkish loan words in Hungarian language ☺Hugarian language has hundreds of Turkish loan words, which show close connection. Christopher Paul Curtis By Ann G. Gaines. What He Wrote Christopher Paul Curtis wrote Bud not Buddy, and The Watsons Go to Birmingham, which both show.